Ever since I read about the new Chanel Rouge Coco lipstick, I knew I was going to get them. The local news grapevine told me it was expected in Malaysia in early April 2010 and I was content to wait. These are some quick pictures taken under flourescent lighting which isn’t the best to take photos under as most people will tell you. But its a close enough. approximation. I’ve got a swatch below and I’ll put up some better pictures later once I’ve used it a bit. From preliminary views, the colour in the tube for Paris looks a deep dark red – see picture above. When swatched however, it takes on a cool blue toned red hue that looks imminently wearable for me. I must say that this one is a cool colour so if you have very warm tones, it might not suit you. 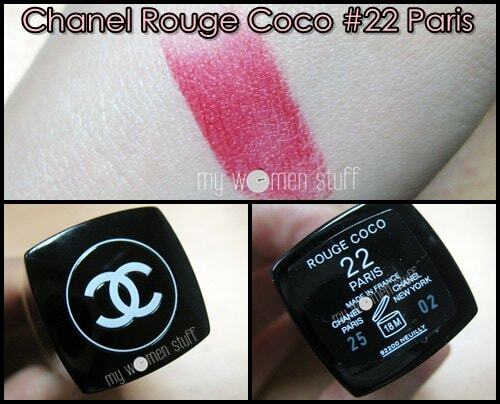 Anyway Rouge Coco in #22 Paris reminds me of Matador in the discontinued Infrarouge line. If I can find my Matador, I’ll do a comparison to see if I’m right. NEXT POST: Am I warm or cool? How can I tell? Any other nice colors? buying from strawberry should be slightly cheaper than retail? I’m waiting for the full range to get here to check out the rest. I wasn’t too keen on the colour selection on Strawberrynet. 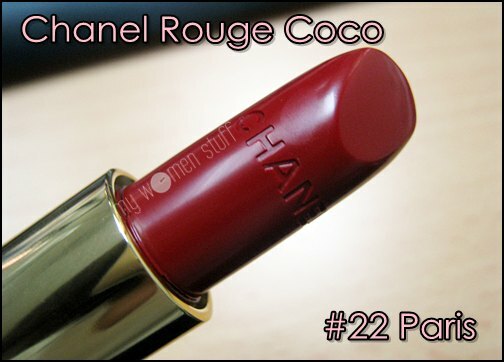 Actually, I think it might be cheaper in Malaysia once it gets here – Chanel usually is – hence I only got 1. Verily so! I wouldn’t pull out A$50 for it but how about $32 online with loyalty discounts? 😉 I’m waiting for it to get here. There are a few colours I want to check out in person before buying and my gut feel tells me its going to be cheaper here anyway. WOW! My grandma would call the shade: Indian Pink (No racist connotations here, and in Hokkien, it would be Keit Leng Na eh Jui Ang Sek). hehehehe. And it is very pigmented indeed, hehehehe. it looks fuschia on sandra bullock! Hmm may be inclined to a true-er red. Definitely trying them out in person before investing! Hmmm, I wonder if after the exchange rate, it’s cheaper in M’sia… Cos I know for branded goods, no matter how you exchange, it’s the same. I might be living in JB for 4-5 months soon. I also want this. hahaha. Gosh. This colour really got me hooked. Just too nice. I never used to go lemming after these things. oops, I mean KL… But I think I will miss my Singapore. Gorgeous, but a bit too blue for me! I’m having so much fun reading your blog 🙂 Thanks for all the fab swatches, tips and RM pricing – great for my holiday budgeting! I love love this lippie as well! Mademoiselle is my fave shade though I think Chintz is a close second!